A class action lawsuit was just filed in Northern Georgia against Mercedes-Benz alleging that the 2003-2009 E-Class sedan suffers from a substantial issue with the fuel tank. "Mercedes has knowingly concealed a defect in the fuel tank assembly that poses a severe safety risk to consumers even when there is no collision or impact to the vehicle." That's a pretty serious accusation, and it isn't the first time a concern like this has been raised. Earlier this year, the National Highway Transportation Safety Administration opened an investigation into the 2003-2006 E55 AMG. According to documents online, the NHTSA alleges that the cars have defective tanks that allow fumes to seep into the cabin and liquid fuel to leak onto the ground. Obviously, a fuel leak is never a good thing and can result in a number of health problems. Other than a 2008 recall to replace some fuel and emissions components in AMG cars, there has been no formal Mercedes recall and it appears that the investigation is still ongoing. The big twist is that the E55 isn't the only car named in this new suit. It's the entire second generation E-Class range. Neil Goro, an attorney at one of the firms that filed the new class action suit, told us that there are three owners that are named in the suit and that at least a dozen others have contacted them with issues in their fuel tanks. Goro also told us that the three people named in the suit have had leaks and fuel issues with an E500, two E55 AMGs, and an E63 AMG, cars that run the gamut of the E-Class range. All of them have strong odors of gasoline, and in one case, Mercedes allegedly charged over $300 to have the car repaired. Goro said that the other dozen owners that have been in contact regarding the lawsuit have a variety of engines in their cars as well. The suit's website highlights a video of a 2007 E63 leaking a tremendous amount of fuel off of the undercarriage as evidence of the issue. So far, Goro has not seen any reports of E-Class related fires or damage here in the US and the NHTSA has received approximately 20 complaints from E55 owners, none of which involved fires or property damage. The complaints received represent a very small percentage of the approximately 8,000 E55s investigated. 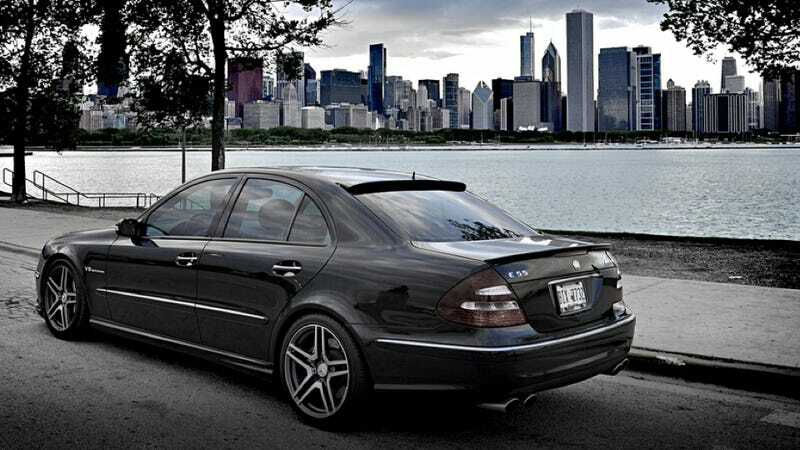 For its part, Mercedes has done much work to prove that the E55 is safe and not improperly engineered. In a letter sent to the NHTSA in April, Mercedes notes that the cars passenger compartments are totally isolated from the fuel tanks which would make it impossible for liquid fuel to enter the cabin, as one owner alleged occurred. The fuel tank is engineered in a way that any small leak would be contained on top of the tank and then evaporate. It is also impossible, they say, for fuel to come in contact with anything hot enough to start a fire. The car also has sensors that monitor fuel tank leaks. Mercedes does acknowledge that if a small leak were to occur, the sensor would not react as quickly as the human nose. Even though they have worked hard to prove that the car is safe, it appears that Mercedes may be very aware of the issue. Posts earlier this year on the MB World forums show that one owner took his car in and asked about the fuel leaks. What started off as a $2,000 repair to totally replace the fuel tank and sending units was talked down to a $500 repair with a service manager when the lawsuits and media coverage were brought up. In fact, the service manager allegedly told this owner that even the new sending units they are using leak and the whole system might need to be reengineered. Now that all the other E-Classes made in that same time period — more than 300,000 cars — are being brought into play, this could turn into a large issues for Mercedes. Since we have not yet been served and therefore we have no official copy of the suit we are unable to comment at this point.